The BabyWombWorld Camp Cot and Co-Sleeper is the perfect baby bed for the modern mom and her home! 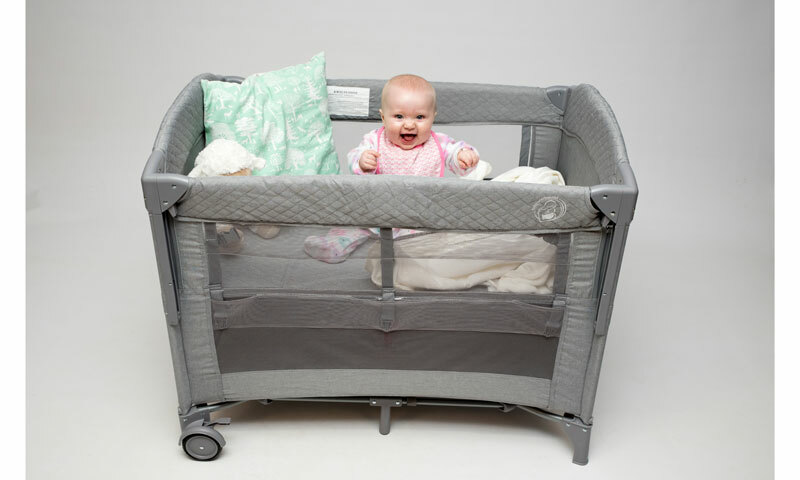 A baby camp cot or referred to as a travel cot can provide benefits to the child. Regular use of a camp cots means that a baby will become used to a sleeping environment outside the usual baby cot which means that they are more likely to go to sleep quicker when they are travelling and sleep for longer and more soundly when they have gone to sleep. Many parents today are using the camp cot as standard baby cots, eliminating the need for traditional wooden baby cots. Having a portable baby cot next to your bed for the first couple of weeks is the preferred choice for new moms and dads. 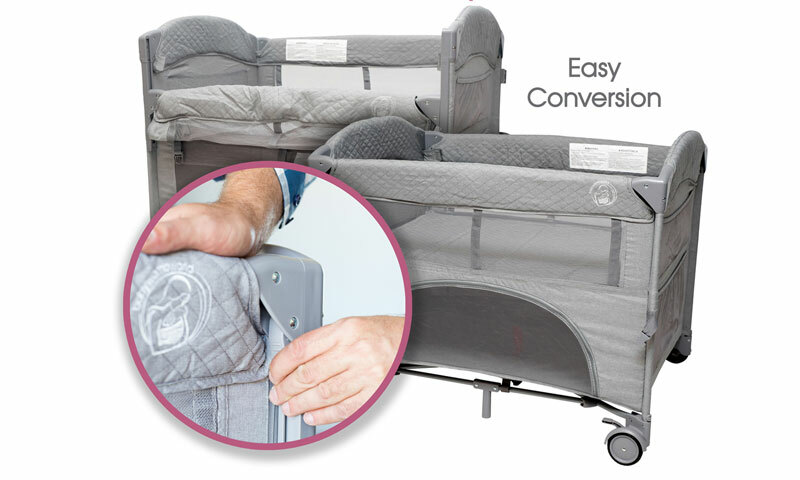 Baby Camp cots have a collapsible frame and a removable mattress. Our camp cot can also be used as a playpen when baby is a little older. But many parents go with a more traditional wooden cot, that will make a beautiful addition to your nursery and often comes with the option to turn into a bed for when your child reaches that stage. BabyWombWorld has now developed a camp cot that will satisfy almost all the needs and requirements of a modern-day parent. 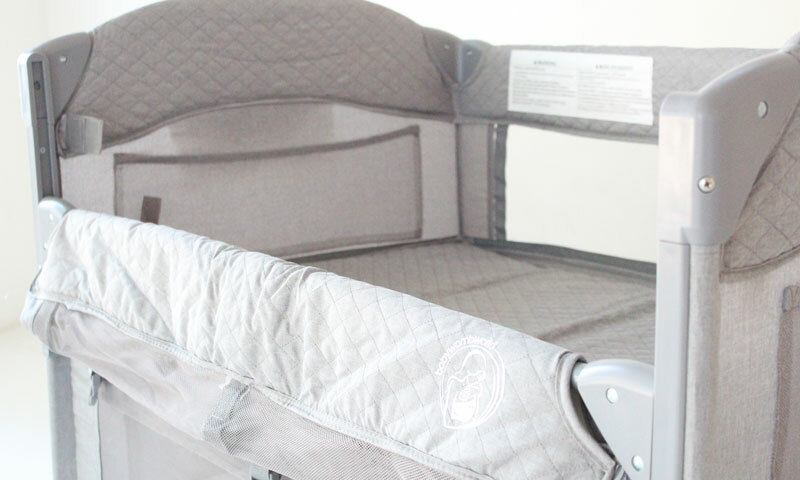 The BabyWombWorld camp cot is made from 300D mélange fabric giving it a stylish look and feel in a light grey/blue color. The camp cot is lightweight, therefore making it easier to pack up and transport. The camp cot comes with a bassinet, which is suited for smaller babies. 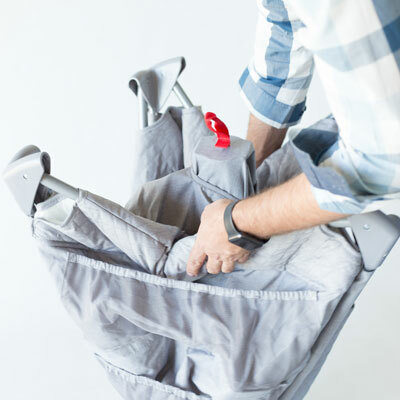 Once baby can support themselves, parents can remove the bassinet from the camp cot. You can also turn the camp cot into a co-sleeper by dropping the one side. 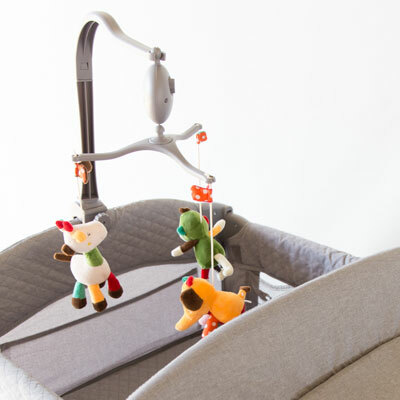 The BabyWombWorld camp cot is made from 300D mélange fabric giving it a stylish look and feel in a light grey/blue color. 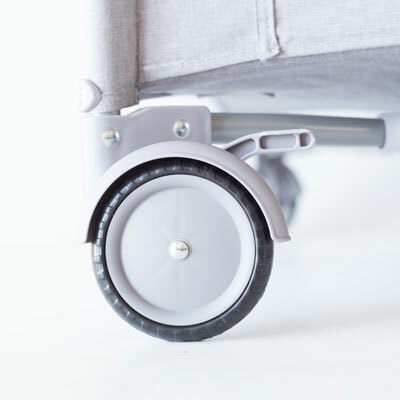 The Camp Cot has a set of wheels with brakes on the one side to move the cot easy and freely around the room without any effort. You can add a practical and stylish toy bar to your cot at an extra cost. Comes with 3 soft toy animals and built-in song. The camp cot is lightweight, therefore making them easier to pack up and transport. The one item your child is most probably going to spend the most time in is his/her bed. And what many parents don't realize is that a baby gets very familiar with this environment. Some parent want a cot in the room and one for travel and as soon as the travel their little one is not happy as you have taken him/her away from their familiar surroundings. But with the BabyWombWorld 2-in-1 camp cot you don't have that problem. You have a bed suitable from birth until your child is ready for his/her own bed! 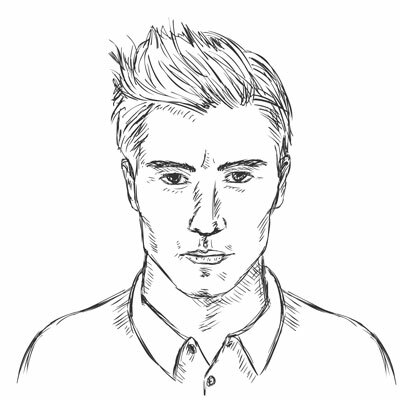 Well designed and constructed. Easy to setup and pack away. Easy to transport in its very sturdy bag. Perfect size when set up. Not oversized like some others I have had.